In advertising, knowing your audience is paramount to getting results. It’s part of creating the overall customer brand experience – the experience that leaves your customer with an impression that will either drive them to repeat or abandon their relationship with your product or service. As sign professionals, we’re in the business of creating an overall messaging plan, including primary and secondary signage, that helps our customers create the experience they want for their customers. If you’re creating an on-site navigation or wayfinding sign program, what types of prompts would your audience prefer? How many senses will you need to appeal to? For example, some businesses and health care facilities are enhancing the customer parking experience using colors and sounds with signage to help patrons and patients find their way back to their vehicles. If you’re not sure of how you want your audience to respond to your sign – remember it, react to it, act on it, etc. – then your sign’s effectiveness is already compromised. Signs add to the customer experience and drive them to an ultimate behavior or ultimate destination. Knowing the ultimate goal will help guide you in designing your signage program. Every sign has a goal, even if it is as simple as providing visibility for a brand. Without a goal, signs are simply reading material. It is possible for a sign to be so over-designed that it takes away from the brand, or over-complicated that it distracts the audience. A professional sign designer and project manager can help you create signage that accurately represents your brand with the panache that turns heads your way and not away. From the type of sign and the construction materials to the placement of the signage, you’ll want to be as deliberate as possible. In our digital age, signs now can be integrated with some interesting and dynamic features and designs. Electronic message centers (EMCs), for example, are very popular additions to existing and new signage. They not only allow quick and easy messaging, but they also provide unique opportunities to meld design and customizable messaging into a customer experience that cannot be found in other mediums. They're flashy, noticeable and remotely programmable, which means you can change the message from the comfort of your office. 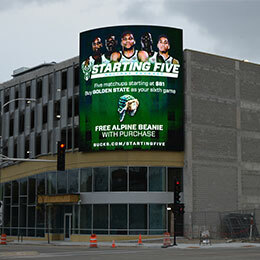 Coming in a variety of sizes and resolution, EMC units can be combined to create a large scale, bright and colorful and dynamic displays, such as the unit Lemberg installed on on the Fiserv Forum parking structure on 6th and McKinley in Milwaukee. 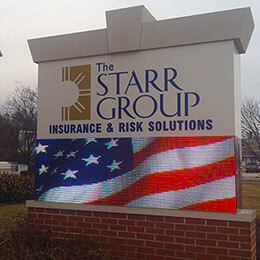 The goal and your budget ultimately drive the type of signage you put into place. To keep things very interesting, some businesses find their new signs somewhere between signage and art, making a truly memorable experience for their audiences. For example, constructing sign facades from unique materials like small pieces of metal that move in the wind creates a dynamic and eye-catching image. 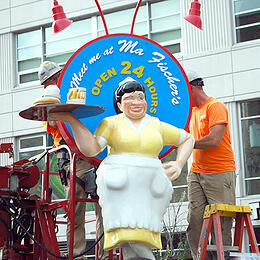 Alternatively, a large replica of your company mascot, such as the Ma Fischer's sign on Farwell Avenue in Milwaukee, creates opportunity for your audience to interact with the sign and make their own memorable moment. Knowing your audience is key to getting them to interact with your business through your signage. Understanding the audience behavior, what you want from them and what will trigger their action can put you one step ahead of your competition. Lemberg Signs and Lighting professionals can help you create a signage plan that represents, motivates and moves your audience. Contact us today! Watch John's segment on Fox 6 Focus, Milwaukee, (March 2019) and learn more about the process of creating a new sign.